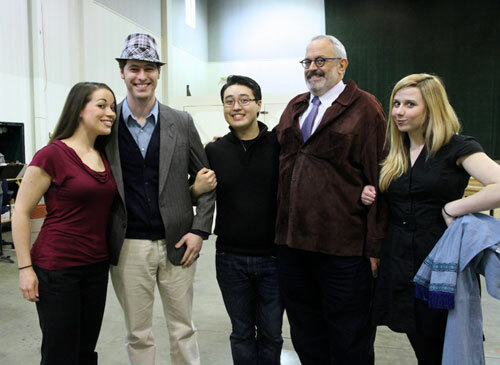 On Saturday the Young Artists Program opens its production of Don Pasquale, which runs for four performances through April 7. Soprano Lindsay Russell will sing Norina on April 1 and 7 (she alternates with Amanda Opuszynski, who sings on March 31 and 6) and today we talk to her about how she became interested in opera and what she thinks about her mischievous character in Don Pasquale. Can you tell us about your background and how you first become interested in being an opera singer? My undergrad was at James Madison University in Virginia, and I was actually a music education major. I was really serious about being a teacher but once I was in school I decided to take studying voice really seriously, as well. I was there with a voice teacher as part of my studies, so why not go for it? I had some success in small competitions and my teacher took me abroad to Germany when I was a sophomore in college and that was my first foray into the real world of opera. In college you do shows and it’s always on the smallest budget in the whole world, and it’s always kind of thrown together, with late nights and a student orchestra. So it was very cool for me to go and see a real working opera house in Germany, even if it was very small and low-level, to see that they have a normal workday and it’s very organized and they can live in one place there because they all have contracts. That got me interested in opera as opposed to being an education major. Your voice type is one of the most competitive, particularly among young singers. Apart from a beautiful voice, what kinds of skills and qualities are required these days to succeed in your part of the soprano world? This is a question that I don’t know how to answer correctly, because I honestly don’t think I know any more than anybody else. I mean, it is very competitive. I think it helps that I look like my part that I’m singing; I still have a baby face and I’m petite. And I think maybe my background in musical theater gives me some skills to transfer over to opera. But, honestly, I feel very lucky that I’m here every day because I know there are a lot of people I went to school with or worked with who haven’t had the opportunities that I’ve had, and I feel they’re equally talented. A lot of times it just comes down to a really great audition, or that the people you’re auditioning for see something that interests them, some unknown quality. 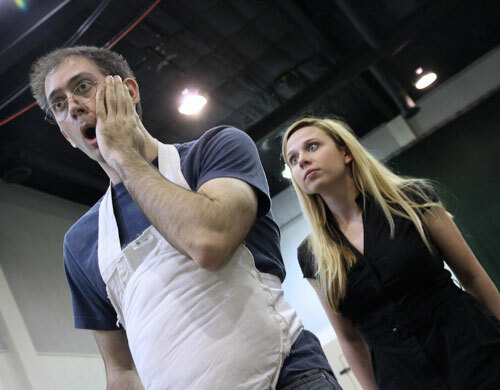 Jason Slayden (Ernesto) and Lindsay Russell (Norina) in rehearsal for Don Pasquale. We hear you recently had the opportunity to sing in China. How did that come about? Yes! I went to China in November to do a concert with the Hong Kong Philharmonic, which is now being run by Michael MacLeod, who used to run Glimmerglass, where I was a Young Artist the past two summers. He is starting to bring over young American singers to do concerts, and the one I sang in was an outdoor concert called “Symphony under the Stars.” The concept was outer space and the night sky, so I sang the Queen of the Night arias and then I sang this really pretty aria from Il mondo della luna. It was really exciting because I didn’t think it was going to be as big a deal as it was, but once I got to the actual venue on the day of the concert, there were probably 20,000 people. It was at a race course in Hong Kong, and the biggest audience I’ve ever sung for. There were video cameras that were zooming in on my face, and a big screen to show everything because it was such a big venue, and then fireworks afterward. How long were you in China? Did you have time to be a tourist? With travel it was six days but I think I was technically only in Hong Kong for three days. The Young Artists Program was very nice to release me from being here, doing Werther, to go do this concert. It was my first time in that part of the world, and my first going abroad completely alone, so I did get a little bit of touristy stuff in. One day I took a little ferry that goes from the island to the mainland and then I just walked. I went about two miles one direction and two miles back and kind of wove in and out of the streets. It reminded me of Chinatown…but it was real, and everywhere! [Laughs] It was so cool. Amanda Opuszynski (Norina, March 31 and April 6), Jason Slayden (Ernesto, April 1 and 7), Andrew Stenson (Ernesto, March 31 and April 6), YAP Artistic Director and Don Pasquale Stage Director Peter Kazaras, and Lindsay Russell (Norina, April 1 and 7). In this production of Don Pasquale, you sing Norina on April 1 and 7. She’s a gifted actress, taking on different personas throughout this opera. Who do you think she really is, and what do you think Ernesto sees in her? One of the difficult things about showing Norina in this opera is she’s very rarely really herself. She’s always putting on a character. There are only a couple minutes where you see her being really honest. I think that deep down, she’s just someone who loves to have fun all the time and I think that’s part of the reason she puts on these characters. I think it’s fun for her, and I think that’s probably what Ernesto sees and loves in her—that she just wants to have a good time. Your character also delivers a slap to Don Pasquale’s face. Why does Norina do that? Do you have to really hit Michael Uloth, or have you choreographed a sound effect at that point? I’m very lucky—I don’t actually have to slap Michael. Actually, He’s lucky! I was in a show a couple years ago where I actually did have to slap my Figaro, and the director wanted a good slap sound, which meant was we had to practice it a lot. I felt terrible, I felt like I was hurting him every day of my life. But here, we’ve staged Don Pasquale so I don’t have to slap him, but it still looks and sounds real. I think the reason Norina slaps Don Pasquale is because she sees the endgame as a life with Ernesto, and this is the way to get it. She’s tried everything else; she’s taken away all Don Pasquale’s money, she’s redecorated his whole house, she’s hurt his pride, she’s taken away all his power with his servants, and I think she knows this will be the last straw. And she’s right, because by the end of the scene he’s done, he’s ready to find any way out of the marriage. She’s pretty much done everything she can to make his life a living hell. 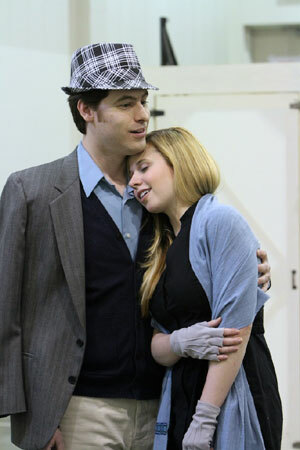 Michael Uloth (Don Pasquale) and Lindsay Russell (Norina) in rehearsal for Don Pasquale. Donizetti’s music is always tuneful and catchy. In your opinion, what’s the difference between singing it well and doing a really great job with it? I think that focusing on the text is very important in this music, and that Donizetti gives a lot of clues as to what his intention was, through his markings and dynamics. I try and pay really close attention to that. Maestro Garman suggested I bring out the text of this one line—“si stava sempre sole” (At the convent, we're always alone)—when I’m playing Sofronia, so I really brought out the “s” sound and that has evolved into a lateral lisp, so I’ve begun lisping throughout the time I’m playing that character. I don’t know if Donizetti actually wanted that, but there are so many little clues in the text that made me think, why not? Had you ever visited Seattle before joining YAP? I came once for 24 hours with my mom, after I found out that I was accepted to the program, because I was overwhelmed at the idea of moving. I’d never lived on this coast before. So we came here for one day and wandered around the area of the opera house and the rehearsal hall. But I love it here; it’s great! I was in New York two years before I was here, and I feel like this is a cleaner, nicer version of New York. All the good things New York has to offer—like great restaurants, great theater—Seattle also has. My absolute favorite thing is flying into Seattle, because no matter which direction you’re coming from it’s going to be ridiculously gorgeous. You’re going to see Mt. Rainier, or downtown Seattle, or the water, or the mountains. It’s kind of magical.